John Elliot has long been convinced that artists should no longer use toxic, life threatening materials to pursue their creativity. He has been a pioneer in the use of profess ional quality oil pastels – dustfree so the medium does not promote respiratory problems – and watersoluble oils – which eliminate the need for toxic petroleum distillate solvents and mediums. Since the late 1950’s, John has been instrumental in demonstrating that fine quality oil pastels can create as vibrant and subtle pastel paintings as the traditional dusting dry, or soft pastels. He was an early artist consultant for manufacturer of the new watersoluble oils starting with their invention in the late 1980’s, early 1990’s. Today John’s concern for not only his own family’s health in his studio/home, but also all artists and art students worldwide, and his special gifts as an artist and teacher, make a unique Master Artist. When someone asks, “Who can show me how to use oil pastels?” the name that comes to mind is “John Elliot.” He is the pioneer in the use of oil pastels and new technology for the pastelist. He is passionate about the medium, and continuously shows its creative possibilities to students, art teachers, workshops, art associations, and art conventions. John is now recognized as a practical, hands-on authority on the use of watersoluble oils. What to do and why, how to begin, how to get special effects, and how to complete and preserve finished works – all the while avoiding the traditional distillate solvents and fumes, so harmful to health and the ecology. An accomplished author, John wrote the first article ever on how to use oil pastels for American Artist Magazine in 1983. He was represented as an oil pastelist in Watson-Guptill’s popular book, Painting With the Pro’s”. He wrote three workshop manuals for HK Holbein: Introduction to Oil Pastels, Oil Pastels and the Portrait, and Oil Pastels and the Landscape. He is the featured artist for numerous Quarto books, including Encyclopedia of Pastels, Painting Heads, Faces, and Hands, Painting Textures, He has written articles for Art News and is featured as an artist in numerous art publications and books. A contributing editor for The Artist’s Magazine, he has written on oil pastel techniques, oil painting techniques, as well as general art how-to topics. He wrote a column on Oil Pastels for The Pastel Journal. His book Oil Pastel for the Serious Beginner was published November 2002 by Watson-Guptill and republished in 2014 by Echo Point Books. He is known in the art field as an inspiring and entertaining speaker. He enjoys media interviews and thrives on promotion events. 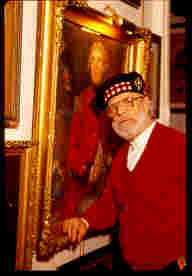 John Elliot is Founder and was formerly President of the Oil Pastel Association and and Oil Pastel Association International. He was a Vice President of the Pastel Society of America, a juror and member of the Salmagundi Club and Society of Illustrators. He was an academy award winning documentary filmmaker on art history, historic preservation, and the sociology of science. Among his commissions are works for Ronald Reagan, Jacqueline Kennedy Onassis, Katherine Hepburn, and other notables. He has work in the Metropolitan Museum, Smithsonian/National Collection of Fine Arts, Fogg Museum, Detroit Museum, and Kentucky Highlands Museum. He is listed in Who’s Who in American Art, Who’s Who in the World , and others. Last modified: September 8, 2014. © Copyright 2002-2014 by Sheila Elliot. All Rights Reserved.